The leaves are just starting to change. I'm so lucky...this is the "somewhat paved" street to my driveway. Alaska is Gorgeous!!! I almost missed the afternoon sun while working at the quilting machine. It seems like I have been waiting forever for sunlight to showoff my quilting!!! This has been quite a quilting season for me! A trip to Bali which was a major bucket-list item. Then I got inspired to stretch my brain...I had to figure out how to get outside my midarm 17" space to quilt on a grander scale. Mistakes along the way? Plenty!!! But thanks to all the wonderful quilters who share their knowledge and experiences on the web...I feel like I have made a major leap in my quilting skills. Lots of tension issues on this quilt...but despite that...the back is still fabulous! I have shared this quilt before but the sunlight makes so much of a difference. This is a pattern called "Irish Mist," from the book, "Six Halves Make a Whole Lot More." 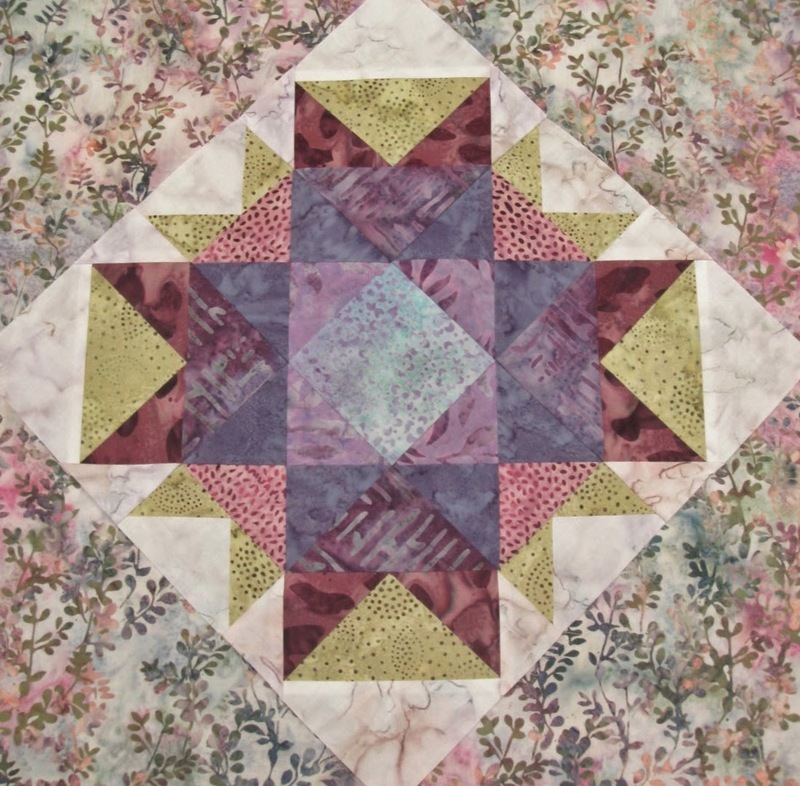 I bought this as a kit at the Houston Quilt Show in 2012. The only thing I changed was the color layout for the squares in the four corners. The pattern called for a random placement of the 2" squares. Nope...can't do random! The pattern was so simple! I first saw this pattern in my Breakfast Club group. This picture does not do this quilt justice. It is beautiful. It won an award in this year's Alaska State Fair. It was pretty but it just didn't sit well with me. I tried a completely different look...very girlie!!! I don't know how I came about putting these colors together but a good stash definitely helped! 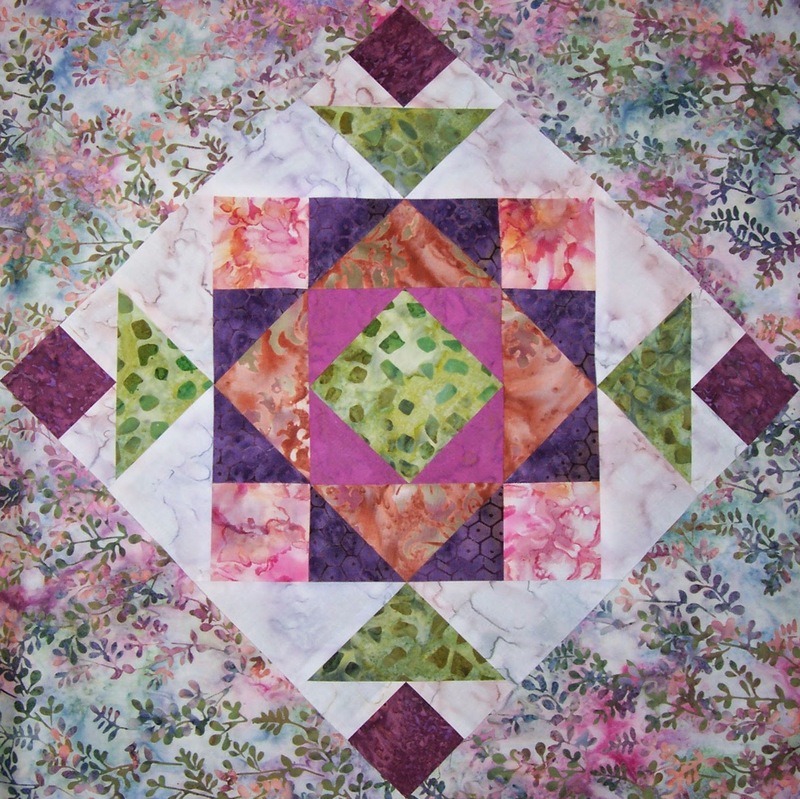 I had loved the inspiration fabric...a Hoffman batik in the colorway Sweet Pea...for a while. It led me somewhere wonderful. I was in love at first sight. Somewhere along the way I have discovered I like orange. I used to hate orange. No orange flowers for me. Orange...at one time was banned from my flower gardens. Sometimes people change. It's now my favorite accent flower color. Go figure! Maybe I should try watching the new show, "Orange is the New Black.?" HAHA...I just looked up what the premise of that show is on Wikipedia...I don't think so! Women in prison...enough said. I was humming along with my new colorway until block five. I thought I wanted more blue. Batiks have a tendency to lean toward the "merky." A little orange solved the problem. Then of course...I wanted to do something different for the final layout than Shannon's plan. I just loved these blocks so much. When in doubt...add a chain. This could be my motto. Here she is...Sweet Peas in the Meadow. She's the first quilt I have double batted with a layer of Hobbs 100% cotton and a layer of Hobbs wool. The wool batting had a few "extra thick," areas that made me a little nervous but everything washed up just dandy. I used a batik backing from Sew Batiks. Their batik backings have a looser thread count than traditional batik backings...a little easier on the quilting machine. Upon finishing this quilt I feel so steeped in the quilting tradition. 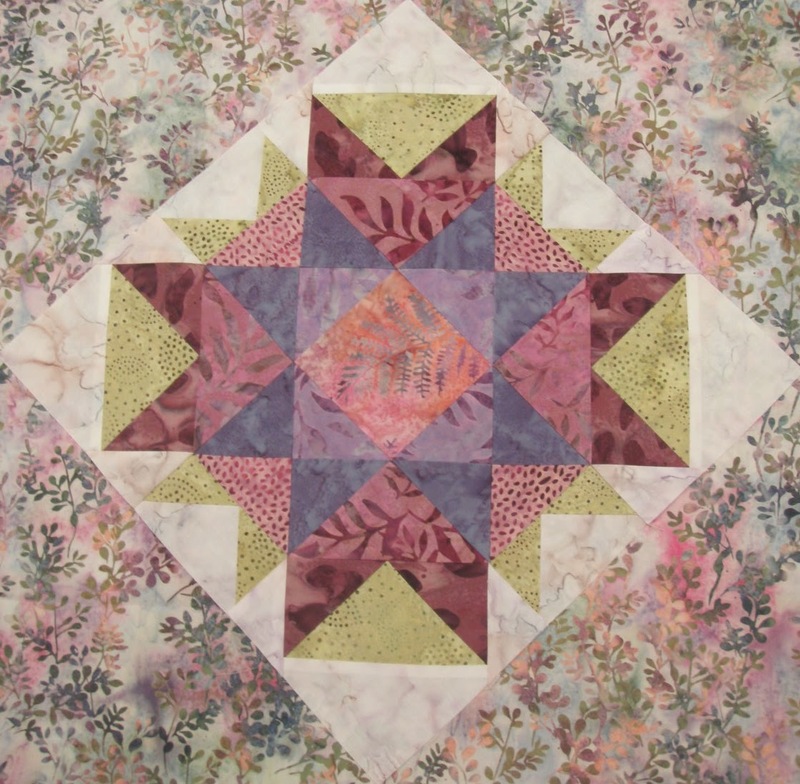 This quilt is all about the sharing that quilters do...thank you so much Shannon. You inspired me! I finished my mini professional tote...LOVE IT! I have Breakfast Club tomorrow. We are doing a mystery quilt that involves Layer Cakes and a yard of background fabric. I'm going with a Hoffman Bali Volcano Layer Cake. I have two pieces of yardage I bought in Bali that I am taking to class...I'll pick the color there with the help of our leader. My green class tote bag is pretty much ready to go...I am going to be so color coordinated tomorrow. My lack of the proper colors of thread for my latest quilting project seems to have gained me an unexpected benefit. While waiting for the thread to arrive I read a blog post from Karen Marchetti on the topic of basting. Here's the posting which details how Karen bastes the entire top before starting her quilting. I think it's the answer to many of the problems I have been struggling with this summer in my quilting. So my first step became to baste the entire quilt. Took me about an hour and since I don't have a basting feature on my machine I did the next best thing and biggie sized some stitches lengthwise about every four to five inches. My quilts are very square so my issue was not working in excess fabric on the front...it was turning the quilt on the frame and having the backing constantly tucking when I tried finishing the quilting on the border. On the last quilt, I tried hand basting the last 14 inches on the two sides that I needed to finish. It worked but I knew there was a better the way! The other advantage to this technique is no hanging batting...I have a front roll and a back roll which gets everything out of my way. I can advance forward and roll back as I make thread color changes. Very hard to do that with the traditional loading of a quilt. I also love that I can easily look underneath and check the backside easily. Despite how great this new technique is going...I have still bitten off a huge quilting design with lots of ruler work which is terribly time consuming. I create these problems for myself...I just can't help it!!! The tension has been stellar on this quilt...except for a wonky moment. I checked the backside and found this mass of thread. It was my top thread...no idea how that came about but I had to reset the timing on my hook to get rolling again. Thankfully it was no big deal and I went right back to great tension. Last night I did some work on the mini professional tote. We are supposed to get the outside shell and the inside lining done so we can join them in class tomorrow night. I had to put an inset zipper in...no problem...I got a handy tip at the last class for this process. First I had to create the faced hole for the zippered pocket. The blue and white fabric is my ironing board cover. Then apply Wonder Tape to the back side to hold the zipper in place while sewing...pins would really be impossible through two layers of Dacor Bond that is adding nice body to the bag. Peel off the paper backing from the Wonder Tape and you have a sticky surface to adhere the zipper in place while you stitch. Magnificent! Zipper in place and top-stitched. As you can see I did get the outside of the bag completed. And I got one part of the lining done, an interior zippered pocket. The class instructor called to let me know I can come in as early as two hours before our class to get some extra instruction...I might be doing that! I've been spending a lot of time in downtown Anchorage this week with my jury duty stint. One of my favorite shops is just a block away from the courthouse. I couldn't resist buying this purse made in Homer, Alaska...it is perfect...check out the craftsmanship. A built-in wallet. I tried that out in my purse I took to Bali and loved it. And another large pocket on the back side with a hidden magnetic closure. Love! Made by the Homer Tapestry Bag Company...she's got a Facebook page with beautiful wool felted bags. I had bags on the brain since last night was my second meeting for the mini professional bag class. I'm behind! I have all the straps top-stitched and the front pocket and bottom straps done. I have some homework to finish before the last class next week...we are all going to finish our bags then! I'm starting to plan my "Paris Projects." I have two sets of Bali pops that have been aging so I have dug through my stash and pulled some fabrics that might work. My challenge will be to keep these projects lap-sized!!!! I'm all ready to quilt this top but waiting for thread to arrive. Poor planning on my part. I'm missing my husband who is back in Paris and don't expect to see him until October but I'm also feeling frantic that my time in Alaska is ticking away and I have so much more quilting I want to get done. It is impossible to meet the goals I set for myself. Then add in the mix that I have jury duty next week. ARGH! I'm trying to make the best of a frustrating schedule so today I organized a cross stitch kit to work on while I'm sitting in the jury waiting room...waiting for something to happen. Last summer my son, Zack, had jury duty and spent three whole days sitting in the waiting room...not getting selected to serve. At least he was released for the rest of the week. I'm still working on marking a quilt top before I load it on my quilting frame. I do this to myself...thinking up complicated quilting designs on large quilt tops. I must learn to make...and like...smaller quilts...really! This week I started a three-part class to make the mini professional tote. Here's a completed version made by the class leader. Part one was cutting out all the pieces and fusing about a two-thirds of the pieces with Decor Bond. We start sewing next week. My main fabric is the black print. The orange will be my contrast, straps and bottom. The gold print is my lining. I'm very excited about this project! We are so lucky to spend time with my dad in the summer. It gets harder to have both my sons with us at the same time but we managed it a couple of evenings this summer. Here we are...me, my dad and John (23) and Zack (20). Both my sons had worked that day in their pilot jobs...they look a little tired to me! And another sure sign of summer...a young moose...there are two! I stepped way out of my comfort zone this weekend to attend a women's handgun course. It helped that I got a friend to go with me. We live in a rural area...and if you read my blog you know we get a lot of visits from brown and black bears. There have also been daytime break-ins at homes in our area. When our security alarm tripped recently it took the police 45 minutes to get to our house. I used to rely on having big dogs with me at all times but I don't have them anymore. Sooo...we have guns...but I didn't know how to use any of them. I changed that this weekend and I am so glad I did. I feel much more empowered now to protect myself. Oddly enough...firing a pistol used the same muscles that were sore from running my longarm quilting machine. Now my arm is really sore!!! But I'll work through the pain. This week I plan to immerse myself back into my comfort zone. Still waiting for better weather to take outside quilt photos but until then I will be starting the next quilting project on the longarm. I spent Thursday and Friday doodling on my plexiglass to figure out my quilting design. The border is inspired by all the intricate doorways I see in Paris...on a quilt named for a bay in Alaska...so appropriate in my world! The quilting plan for the interior of the quilt. Apparently I am a little hard on seam rippers...I went to pick this up the other day and realized the tip had broken off....oops! I also started top stitching around these salmon on a quilt that has been sitting in the limbo for way too long. Only 11 more fish to top-stitch. 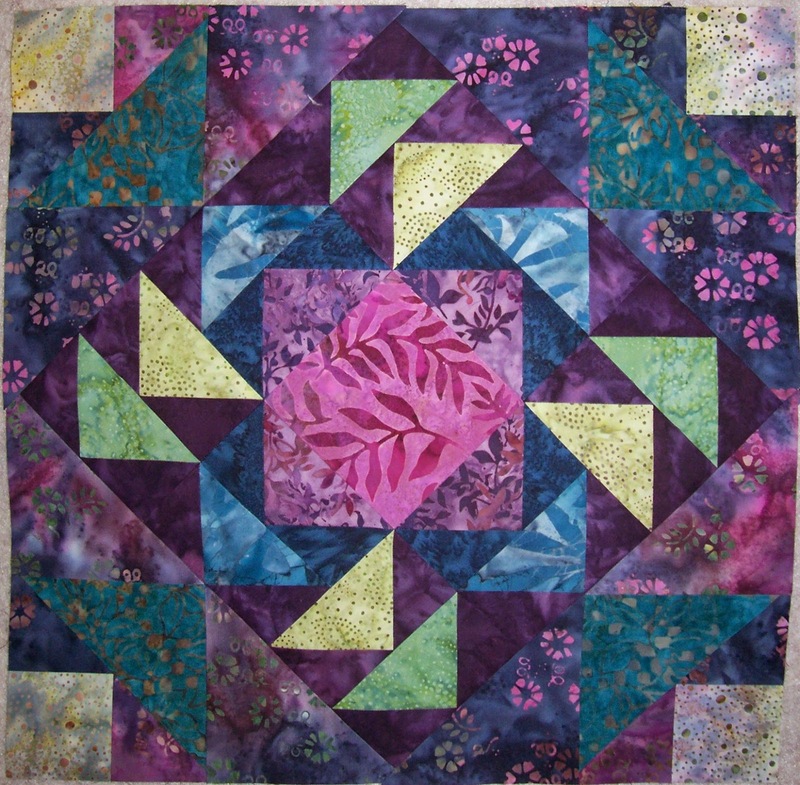 I'm joining the quilting world at Design Wall Monday with Judy at Patchwork Times. Yes...binding clips in site! This quilt took forever to quilt...on the frame four weeks...but the great news is no tension issues! My newest theory is my problems have something to do with the actual tension used on my bobbin winder. It will take a few more quilts to see if this is true but I tightened up my bobbin winder and had almost no trouble with the tension. I came up with this idea after reading several comments on a Yahoo Nolting Quilting group where many quilters stated they used pre-wound bobbins exclusively and never had tension issues. I think relying on pre-wound bobbins is one more step I just don't want to do!!! I already live too dependent on the mail for all my longarm supplies. Plus it is another added expense. FYI...I use Bottom Line exclusively in my bobbins for quilting on my Nolting which is a common thread for pre-wound bobbins. connected with a chain-style block. 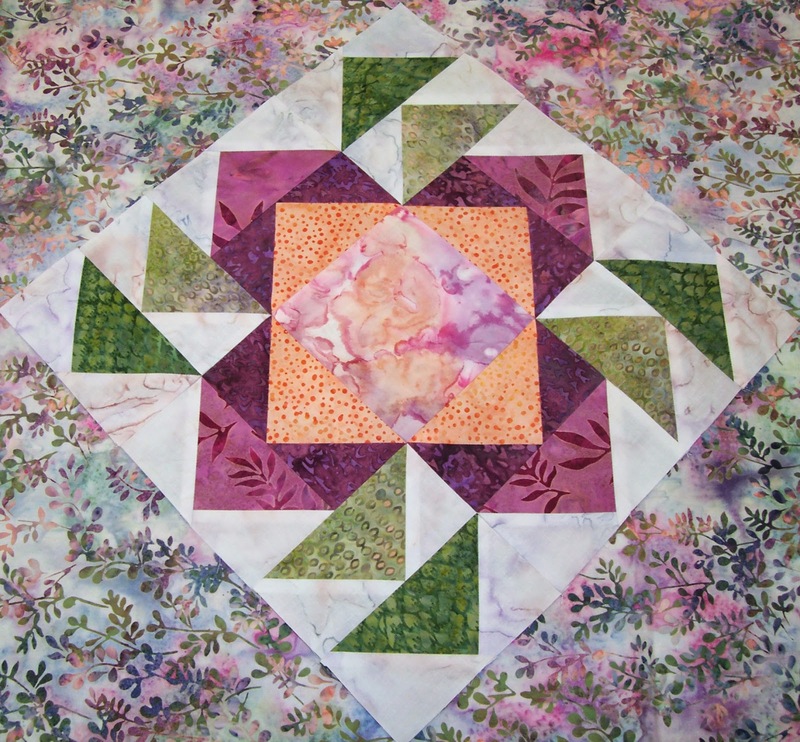 The quilting design for the sampler blocks from the backside. 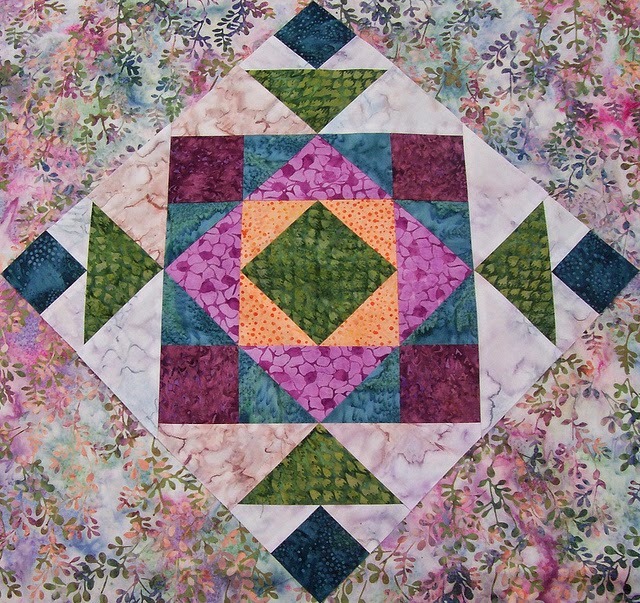 The quilt design for the chain blocks. Here's a corner....with all the template work to make those circles!!! Love the look...but so tedious compared to cranking out a free-handed feather design. It has been raining the past two days...but when the weather cooperates I will share a full view...it's my favorite quilt to-date! I completed the last Jim Shore Santa ornament in the series of six. I saved the stocking Santa for last..because I do love Christmas stockings! This series of ornaments was a little more work than the Mill Hill Santas I love....more floss color changes. I've got another challenging quilt planned for the frame next. I will be tackling "McTavishing," for the first time in my design.